Great looking faucet. It is well made and makes the kitchen look more modern. The faucet was extremely easy to install and the instructions were easy to understand. I would definitely recommend this faucet if you are interested in this style. 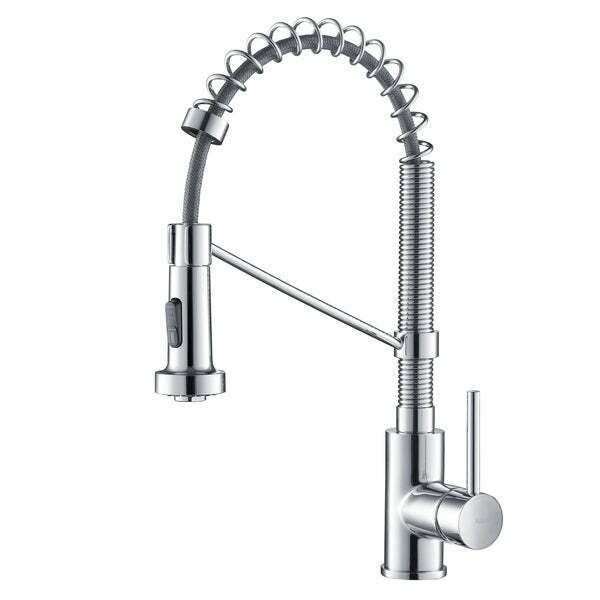 Bring the technology, convenience, and durability of an industrial restaurant-quality faucet into your home with this Bolden dual function kitchen faucet. The Bolden has a host of convenient features to make your clean up and meal prep less time and labor intensive. The 20-inch hose is retractable, making it perfect for even a deep sink, and you have two different spraying options; a high-powered stream for cleaning messy dishes, and a water-efficient aerated stream for washing hands and lighter tasks. 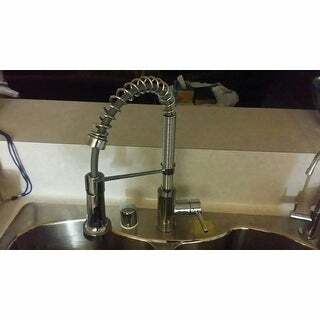 Faulty faucet. Plumber says he sees it often in theses cheap made in china faucets. Looks nice though! I love this faucet! 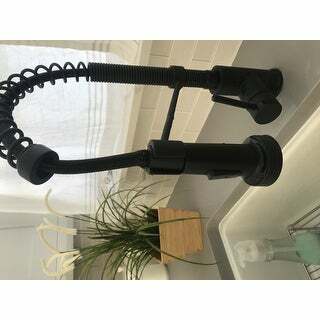 Looks great and is very easy to use both as a stationary faucet and as a flexible sprayhead which extends beyond the sink. Love this faucet! Matte black just as stated and that is exactly what I was looking for. You can’t find faucets like this at the local home improvement store for this price. It came quickly and was easy to install. We have had other Kraus faucets and they have always worked well for us! I love the look of it, it’s flexibility and utility. The extending hose is helpful, and the switch to change spray types is easily accessible and very useful. The quintessential faucet for the modern farmhouse. Not too tall but not too small either. The stainless steel finish is slick and matches perfectly with my other appliances. Buy it and you will be forever loving doing the dishes! 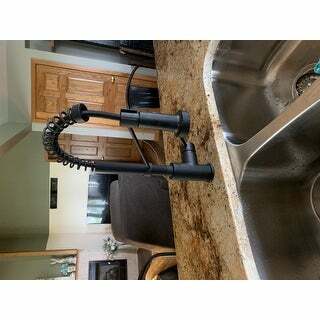 Oh I LOVE LOVE LOVE my new faucet.... A kitchen faucet is so important and this one looks as good as it functions! I love this faucet - its very sleek, modern, and high-end looking. The finish is beautiful (we got the matte black color) and the install was easy and straight forward. "Do any of the Kraus Pull Down Kitchen Faucets come with a base plate to cover up a sink/counter with 3 holes?" Hello, Thank you for your inquiry. 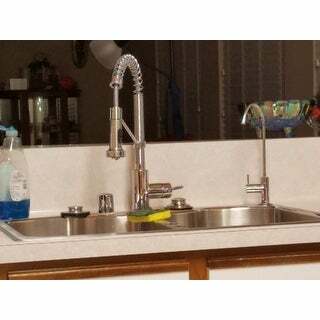 We have various kitchen faucets that are supplied with a deck plate. When searching you can confirm by checking the model spec sheet to see what is including. If not included we would recommend you purchase DP01 which is available in matte black, chrome, and stainless steel. "Will this Faucet work in Uganda with European Plumbing?" "Is this a Kraus faucet?" Yes, this is a Kraus faucet, I have it and love it. It has the Kraus name on the front of it, and came in a Kraus box. "What is the diameter size of the bottom of the faucet?" The measurement is approximately 2.12 inches. All of the good reviews for this brand and Overstock was also the best price available. Reviews were good. Like the combo finish. "How is the water pressure?" The Flow Rate (GPM) is 1.80, we have not received any complaints with water pressure. The stream pressure is sufficient to remove food of plates. "How far can you pull out the sprayer? Can you pull it all the way to the base of the sink?" Yes, the sprayer reaches the base of the sink. I've never actually tried to pull the sprayer out as far as it will go, but I routinely put a gallon-size drink container on the counter to the left of the sink and pull the sprayer over to the top to fill it with water, and there's never been a problem. I'm really pleased with this faucet overall - the function, the looks, and the quality of it. 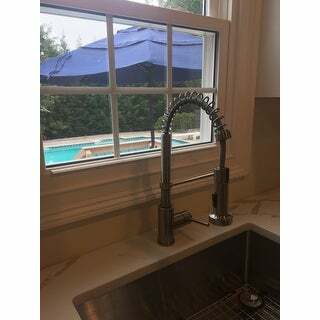 I would recommend this faucet to anyone that wants a commercial look without the monster size of a real commercial faucet, and if I ever end up moving, I would want this faucet or a similar Krause faucet in a new place.